OK now you've got your LCD, you'll also need a couple other things. First is a 10K potentiometer. This will let you adjust the contrast. 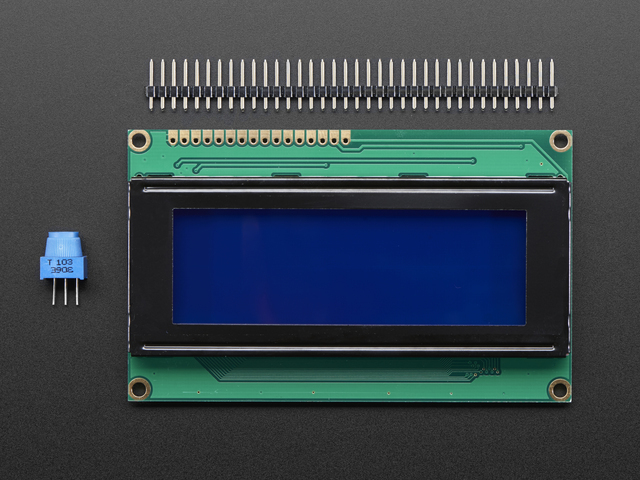 Each LCD will have slightly different contrast settings so you should try to get some sort of trimmer. You'll also need some 0.1" header - 16 pins long. If the header is too long, just cut/snap it short! K now we're onto the interesting stuff! 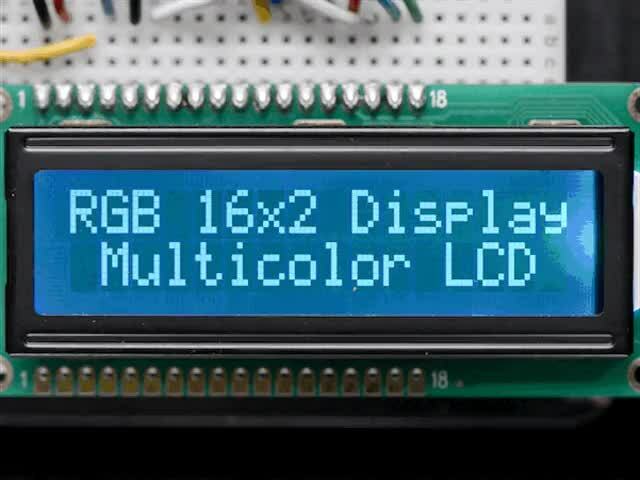 Get your LCD plugged into the breadboard. Now we'll provide power to the breadboard. Connect +5V to the red rail, and Ground to the blue rail. Next we'll connect up the backlight for the LCD. Connect pin 16 to ground and pin 15 to +5V. 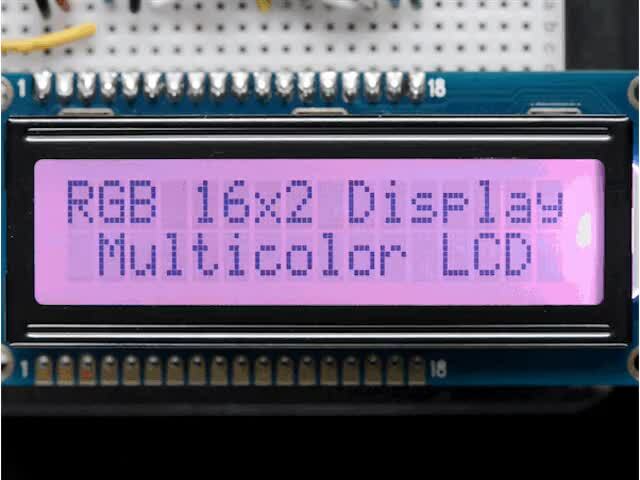 On the vast majority of LCDs (including ones from Adafruit) the LCD includes a series resistor for the LED backlight. If you happen to have one that does not include a resistor, you'll need to add one between 5V and pin 15. To calculate the value of the series resistor, look up the maximum backlight current and the typical backlight voltage drop from the data sheet. Subtract the voltage drop from 5 volts, then divide by the maximum current, then round up to the next standard resistor value. For example, if the backlight voltage drop is 3.5v typical and the rated current is 16mA, then the resistor should be (5 - 3.5)/0.016 = 93.75 ohms, or 100 ohms when rounded up to a standard value. If you can't find the data sheet, then it should be safe to use a 220 ohm resistor, although a value this high may make the backlight rather dim. Connect the Arduino up to power, you'll notice the backlight lights up. 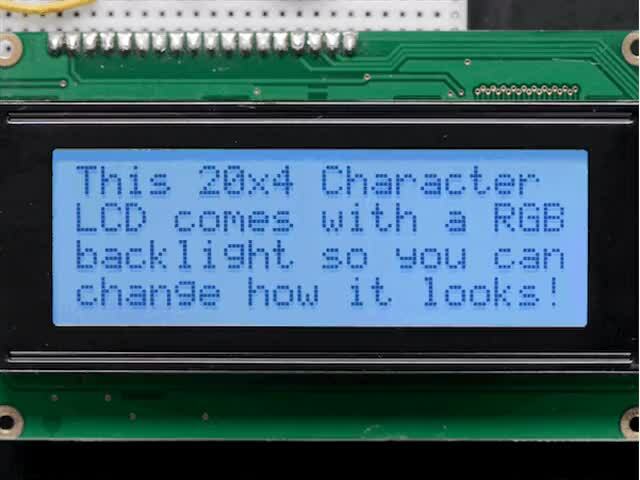 Note that some low-cost LCDs dont come with a backlight. Obviously in this case you should just keep going. Next, lets place the contrast pot, it goes on the side near pin 1. Connect one side of the pot to +5V and the other to Ground (it doesn't matter which goes on what side). The middle of the pot (wiper) connects to pin 3 of the LCD. Now we'll wire up the logic of the LCD - this is seperate from the backlight! Pin 1 is ground and pin 2 is +5V. Now turn on the Arduino, you'll see the backlight light up (if there is one), and you can also twist the pot to see the first line of rectangles appear. This means you've got the logic, backlight and contrast all worked out. Don't keep going unless you've got this figured out! The good news is that not all these pins are necessary for us to connect to the microcontroller (Arduino). RW for example, is not needed if we're only writing to the display (which is the most common thing to do anyways) so we can 'tie' it to ground. 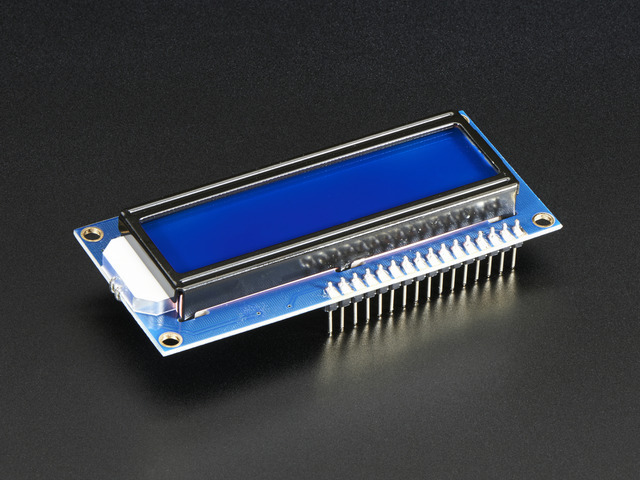 There is also a way to talk to the LCD using only 4 data pins instead of 8. This saves us 4 pins! Why would you ever want to use 8 when you could use 4? We're not 100% sure but we think that in some cases its faster to use 8 - it takes twice as long to use 4 - and that speed is important. For us, the speed isn't so important so we'll save some pins! 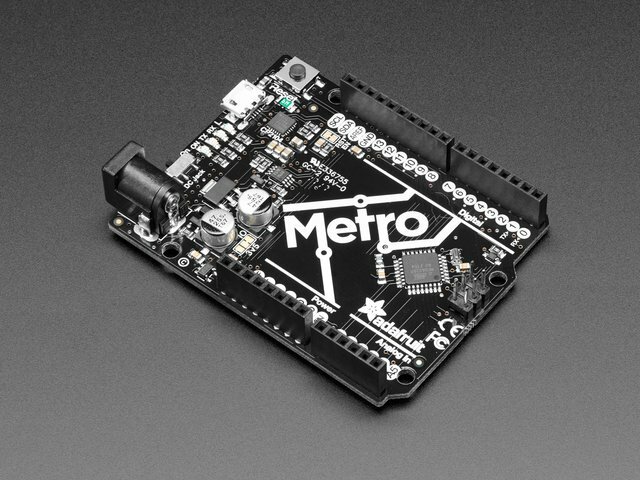 So to recap, we need 6 pins: RS, EN, D7, D6, D5, and D4 to talk to the LCD. As mentioned, we'll not be using the RW pin, so we can tie it go ground. That's pin 5 as shown here. Next is the RS pin #4. We'll use a brown wire to connect it to Arduino's digital pin #7. Next is the EN pin #6, we'll use a white wire to connect it to Arduino digital #8. Now we will wire up the data pins. DB7 is pin #14 on the LCD, and it connects with an orange wire to Arduino #12. Next are the remaining 3 data lines, DB6 (pin #13 yellow) DB5 (pin #12 green) and DB4 (pin #11 blue) which we connect to Arduino #11, 10 and 9. You should have four 'gap' pins on the LCD between the 4 data bus wires and the control wires. This is what you'll have on your desk. This guide was first published on Jul 29, 2012. It was last updated on Jul 29, 2012. 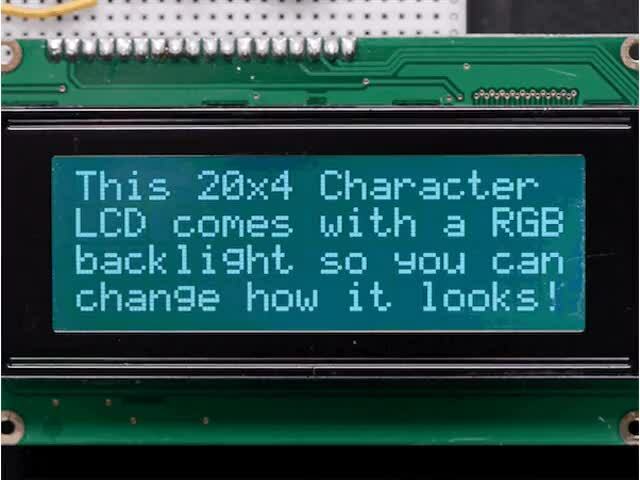 This page (Wiring a Character LCD) was last updated on Apr 19, 2019.